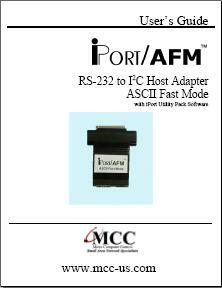 iPort/AFM brings I2C directly to any computer with a legacy or add-on RS-232 serial port. Just plug an iPort/AFM into your computer's serial port, load our free software, and you will be sending and receiving I2C Bus messages at up to 400Kbit/s in seconds. Selectable 19,200, 57,600, and 115,200 RS-232 Baud Rates. Compatible with existing iPort/AI applications. The iPort/AFM is our fastest and most powerful I2C Bus host adapter. 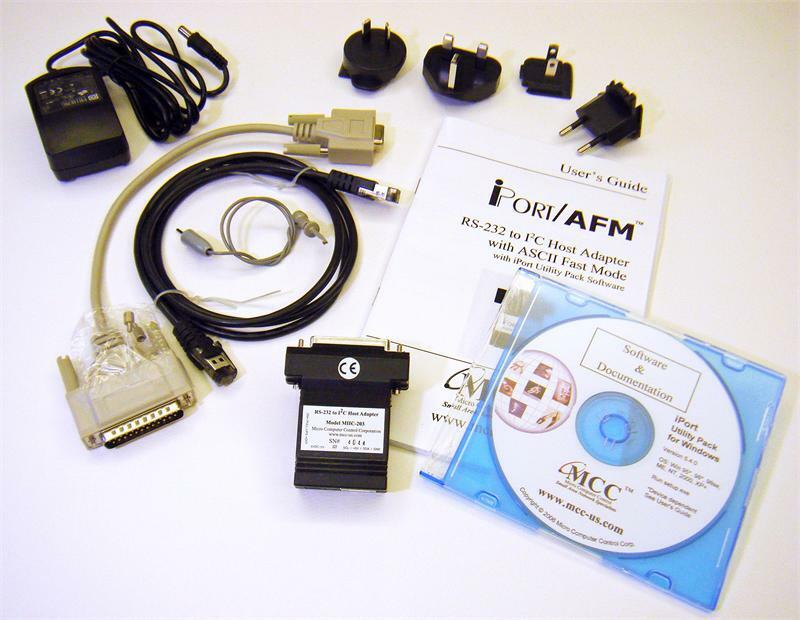 Its RS-232 serial port interface and simple ASCII commands allows the iPort/AFM to operate with any operating system, and its compatible with most embedded systems. Applications include product development and testing, EEPROM loading, device control and sensor networking. Over the past few years, the I2C Bus has expanded from simple control to data intensive applications. As new uses arise, bus bandwidth and message overhead have become key issues in product design and testing. The iPort/AFM, our third generation adapter for the I2C Bus, addresses these issues by supporting several bus speeds, including fast mode (400kbit/s), and three RS-232 transfer rates up to 115.2K baud. Implemented using a high-performance bus co-processor with optimized instruction set, the adapter also includes large message buffers (256 bytes) to reduce host computer and bus overhead. In addition to operating as a bus master or slave in a multi-master system, a built-in bi-directional /INT signal line allows the device to receive or generate slave only device notifications. The iPort/AFM will work with any application written for our iPort/AI, only 4 to 40X faster. When operating with new applications written specifically for the iPort/AFM, speed increases up to 100X faster are possible. Master and Slave, Transmit and Receive, iPort/AFM supports I2C message modes including Multi-Master, Arbitration Loss Detection, with messages from 1 to 32K bytes in length. This command resets the iPort/AFM to its default state. Enables/Disables iPort/AFM response to I2C Bus General Call (00) messages. Sets iPort/AFM's own I2C Slave Address. iPort/AFM will respond to I2C Bus messages sent to this address. Activates iPort/AFM as an I2C device attached to the bus.